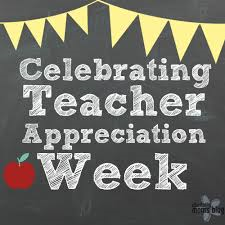 All Star Teacher Appreciation Week - We are celebrating Teacher Appreciation Week on Monday, May 6th to Friday, May 10th. HMS PTSA would like to thank all the teachers and staff for their dedication and hard work this year. We need your help! You can help by volunteering and/or donating $ for gift cards. We have a week of fun filled events - See below for the activities and sign up opportunities. We also would love to give every teacher/staff (about 170) at least a $10 gift card (as part of our daily drawing). Please sign up below to make this a memorable event for all the faculty and staff at HMS. Several ways to donate: Venmo (@Genny-Tuggey) or PayPal ([email protected]). Send checks to HMS Middle School, note Teacher Appreciation to front office. Breakfast of Champions - Serve our awesome teachers and staff. Tailgate with Varsity Food Truck - Serve our awesome teachers and staff. Concession Stand Pizza - Serve our awesome teachers and staff. Timeout for Dessert - Serve our awesome teachers and staff.